Hello my lovelies! It's not such a great Monday for me because I've been sick with the flu all weekend. Today I had to go to work even though I wasn't feeling very well, so I did my best to do my nails yesterday because they really needed it. I wasn't able to create something complicated so I did a simple stamping manicure over an a-england polish that is just gorgeous. Here's what came out. This beauty is called Dancing with Nureyev and it's not the first time I'm showing it to you. In fact I can't believe it's been 3 years since I first welcomed this wonderful polish in my collection. It really deserved to be admired again. It's a light purple leaning blue with a muted holographic effect. The light box photos, like the one above, show the color a bit better while the direct light ones show the holo but make the polish look more silver than it is in real life. Here's an example. For the stamping I chose a geometrical image from plate 08 Geometry from Moyra. 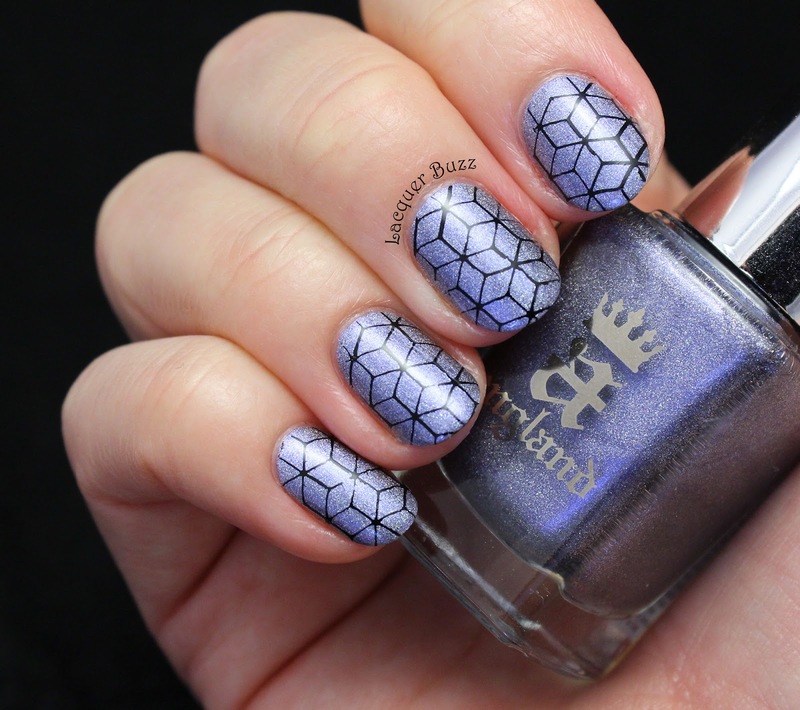 I really love the contrast between the elegant base and the edgy stamping, plus I am a big fan of such patterns. I used Mundo de Unas Black as a stamping polish. This manicure is really easy to create and to wear. I'm looking forward to seeing these in the sun if the weather will be kind in the following days. Don't forget to check out the rest of this month's Monday Blues in the links below!